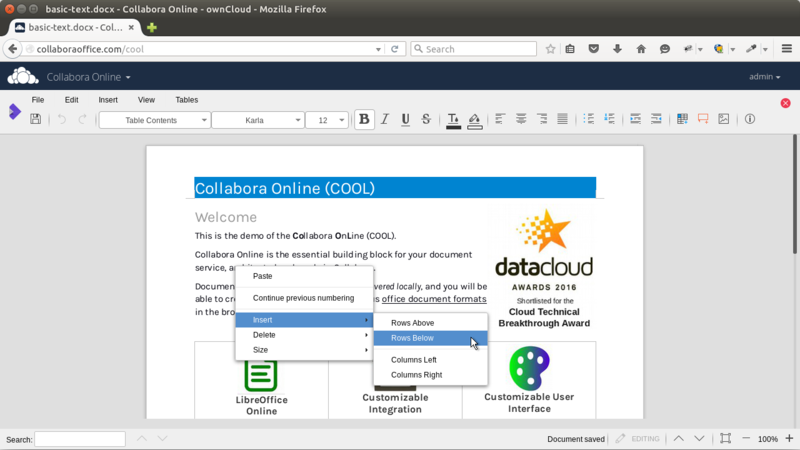 Collabora Productivity releases Collabora Online 1.0 “Engine” for Hosters and Clouds. 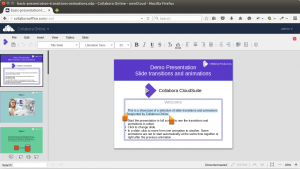 Collabora Productivity, the driving force behind putting LibreOffice in the Cloud, has released the first production grade version of Collabora Online, its flagship cloud document suite solution. 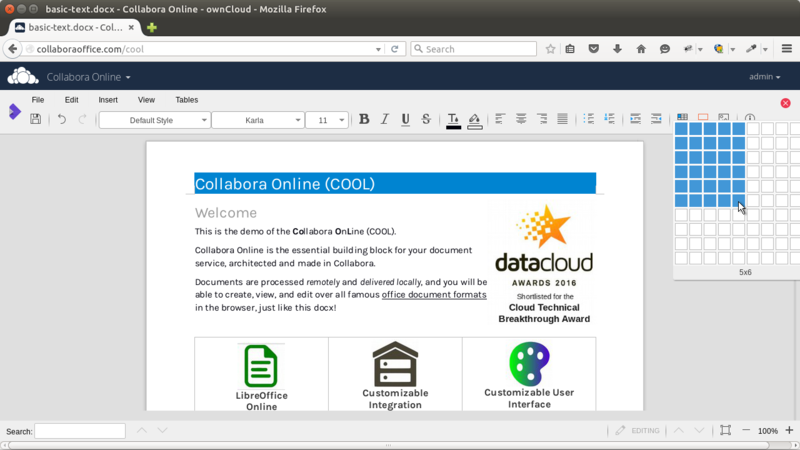 “Engine” is targeted specifically at Hosting and Cloud businesses who wish to support both commercial and consumer document viewing, creation and editing services in their portfolios. 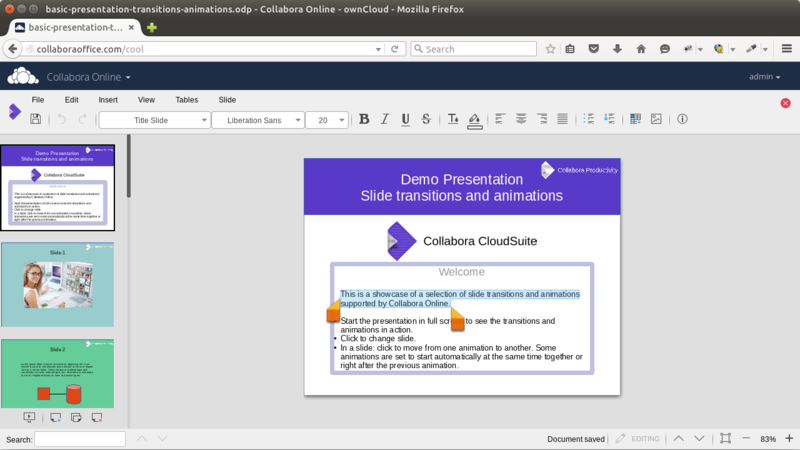 Collabora Online 1.0 “Engine” is a powerful LibreOffice-based online office suite, that enables users to access documents online, author new content and work collaboratively. 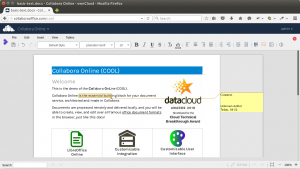 Collabora Productivity offers customizable integration with existing infrastructure (identity management, storage, HA etc.) and tailor solutions to existing hardware and network needs. Collabora Online 1.0 “Engine” is designed to easily be adjusted to any online environment, so it will share the same look and feel. Want to try it out yourself? 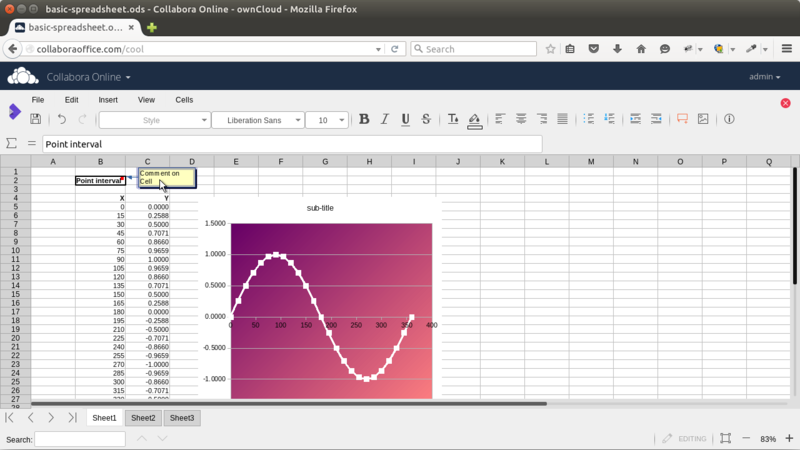 Simply fill in this demo form and get receive access to the demo. 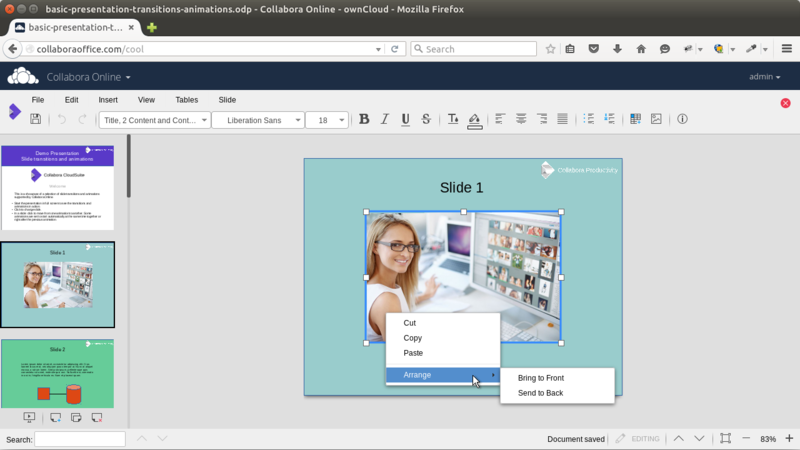 The demo includes the files that were used for the screenshots above. Seafile to integrate Collabora CloudSuite as it continues its rapid expansion in Chinese and European markets. Read this press release in English, French or German. Collabora Productivity, the driving force behind putting LibreOffice in the Cloud, has been selected by Seafile, a leading open source file sharing vendor, to deliver file rendering and editing functionality throughout the Seafile product range. Seafile, with offices in both China and Germany, offers private and hosted file sharing solutions (EFSS Enterprise File Sync and Share software) to both the commercial and consumer markets. 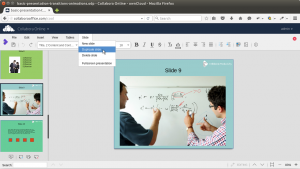 “Editing files online is something our customers ask us for a lot and we are very happy to have found a great partner in Collabora Productivity that helps us to extend Seafile in this direction. 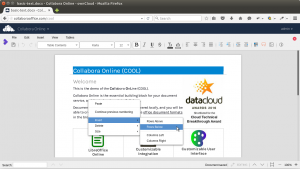 I can’t wait to start using Seafile and Collabora CloudSuite together myself.” said Silja Jackson, CEO of Seafile GmbH. If you are interested in receiving pre-release information and early access to Seafile with integrated CloudSuite, please contact sales@seafile.com, sales@seafile.de or sales@collaboraoffice.com. Seafile is a cloud storage platform for enterprise environments with sharing and collaboration features and a focus on safety and reliability offering native client apps for most major operating systems like Windows, Mac OSX and Linux as well as iOS and Android. Seafile is developed by a global team, spread over two companies: Seafile Ltd., located in China and Seafile GmbH, located in Germany. With a user base of more than 250 000 active users, Seafile counts industry clients like Kaspersky Labs and Ping An China to its Seafile Professional customers as well as European universities like HU Berlin and Université de Strasbourg. 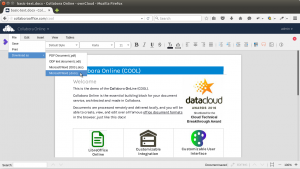 Ag-I Solutions and Ebikko open the door to the Asian Electronic Document Management market for Collabora and LibreOffice. 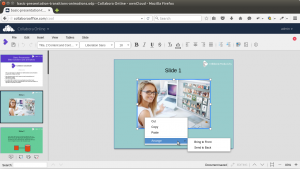 Ag-I Solutions, the creators of the Ebikko Electronic Records Management Suite and Collabora Productivity, the driving force behind LibreOffice Online, are to deliver a joint solution in the second quarter of 2016. The integrated offering is in response to significant market demand to both create and collaborate over documents within the Ebikko Records Management Suite rather than having to depend upon an external source. 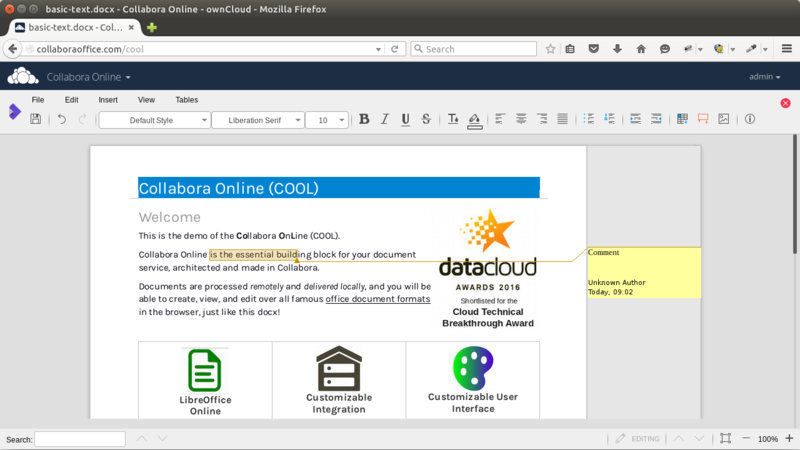 Ebikko, an APICTA award-winning cloud application built to ISO 16175 standards, will use Collabora CloudSuite technology to enable the additional functionality. 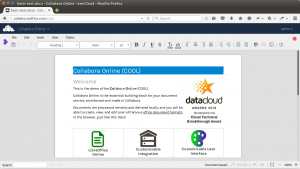 “The records management market has been complicated by the emergence of the giant cloud providers” says Michael Meeks, General Manager at Collabora Productivity. 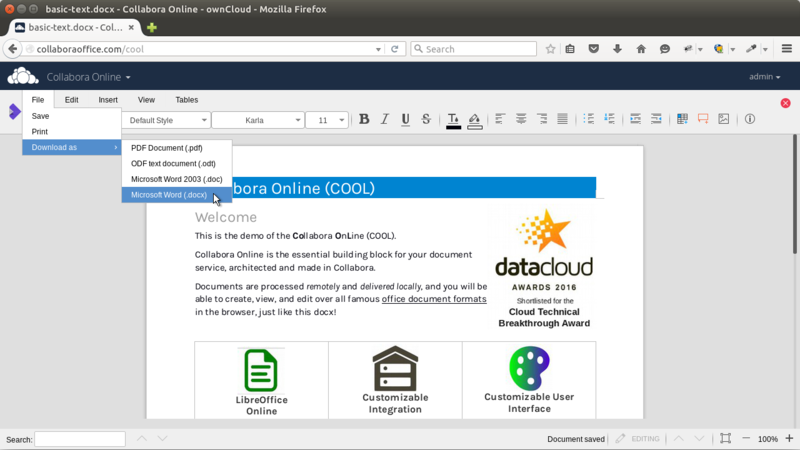 “The marriage of Ebikko and Collabora CloudSuite redresses this balance in favour of simplicity and control by allowing enterprises and governments to create, manage and collaborate over documents wherever they wish, either behind their own firewalls or on a public cloud or territory of their choosing”. 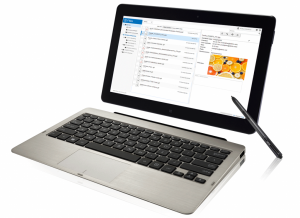 If you are interested in receiving pre-release information and early access to Ebikko Electronic Records Management with integrated CloudSuite, please contact info@ag-isolutions.com or sales@collaboraoffice.com. 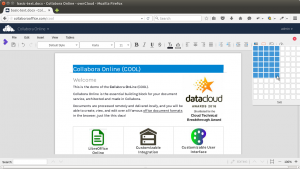 DAASI International signs up with Collabora Productivity and integrates CloudSuite/LibreOffice Online as a pilot into the European Commission funded AARC project. As an open source expert for authentication infrastructures, authorisation, encryption and databases, DAASI International will provide Identity Management integration solutions for CloudSuite. They will also offer support and implementation services for companies who want to integrate CloudSuite into their IT landscape. Additionally, DAASI International will integrate CloudSuite as a pilot into the European Commission funded AARC project (Authentication and Authorisation for Research and Collaboration). AARC brings together partners from amongst National Research and Education Networks, e-Infrastructures Service Providers and libraries and aims to develop and pilot an integrated and interoperable framework for Federated Authentication and Authorisation Infrastructures (AAI). “After many years of successfully deploying LibreOffice in all our business activities, we as an Open Source company are very happy to now actively contribute to the development of the next step into the cloud. We are bringing in our many years of experience in the fields of identity management and single sign-on technologies. On the one hand we designed the respective framework and are helping in implementing it, on the other hand we broadened our business segment, to support enterprises to move into the cloud with CloudSuite and to integrate their identity management system” said Peter Gietz, CEO of DAASI International. 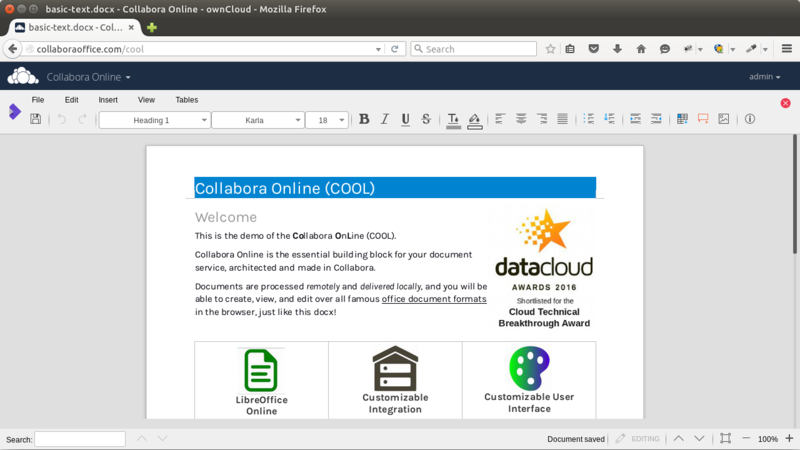 If you are interested in receiving more information, please contact info@daasi.de or sales@collaboraoffice.com. DAASI International is one of the leading providers for open source software in the areas of federated Identity. For more information, please visit www.daasi.de.